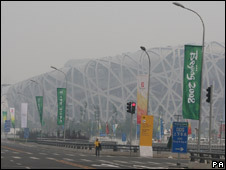 Beijing's main Olympic stadium was barely visible under the city's murky sky on Monday, just four days before the Games are due to begin. An Olympic official said the low visibility was due to high humidity, a natural phenomenon, state media said. But he was optimistic that athletes, officials and spectators would enjoy good air quality during the Games. The spokesman for the organisers, Sun Weide, said pollution control measures over the past decade would work. According to data from Beijing Environmental Protection Bureau, air quality on Monday was still considered a "blue sky day". But the BBC’s own test found one major pollutant, particulate matter, was almost six times higher than the recommended level. The World Health Organization’s target is 50 micrograms per cubic metre. But we recorded levels in Beijing at 292 micrograms on Monday. The test was done at a time of day when many Olympic events will take place. The International Olympic Committee has said endurance events lasting more than one hour could be delayed if the pollution is too bad. But it remains unclear how bad the pollution has to be before an event is postponed. 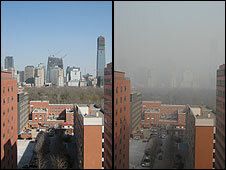 Beijing has taken some drastic measures to improve the air quality for the Games. Almost a third of Beijing’s 3.3 million cars have been taken off the city’s roads.